Each type of lock is built differently, but let’s take a look at the anatomy of a typical door lock usually used in homes or light commercial buildings. The main parts of a door lock are the cylinder, bolt, box and strike plate. It’s useful for any DIY-er to know how things around the home operate. Understanding the different parts that work together to make a door handle and lock work, can help you fix minor problems on your own. Remember, if you’re having problems with a sticky or faulty door, knob, handle or lock, trust the skilled locksmiths at Great Valley Lockshop to help. Diagram showing the parts of a door lock, including the knob, rose, cylinder, latch assembly, bolt and strike plate. The cylinder, or lock body, is the part of the door lock where you insert the key. When it’s locked, the cylinder engages a series of spring-loaded pins which keep the cylinder from turning. When you insert a key, the uneven edge pushes the pins upward to fit the key’s height in that location within the lock body. Essentially, it recognizes the correct key when the pins move into their proper places. This “opens” the cylinder, allowing the bolt to move, and you to open the door. The lock engages a bolt inside the door. This piece of metal extends from the door into the frame and holds it closed. There are two main styles of latch (or bolt)—a spring bolt and a deadbolt. Spring Bolt – A spring latch is a bolt held in place by a spring clip. The spring is compressed to unlock the bolt, and when released, it snaps into a locked position. This type of door generally locks automatically when closed. Deadbolt – A deadlatch does not have the spring loading mechanism. It can be locked or unlocked at any time using a key or with a knob on one side of the door. Deadbolts are generally considered to be the more secure choice between the two types of bolts, especially when the lock has a deadbolt plunger. The deadbolt plunger (or guardbolt) is smaller and directly next to the deadbolt; its job is to prevent the lock from being picked or ‘jimmied’ open. The bolt extends from the cylinder into a small square shaped hole—this is the “box”. It is designed to hold the bolt securely in the doorframe when the lock is engaged. The metal plate, which attaches to the frame of the door, is the strike plate. The purpose of the strike plate is to guide the bolt from the cylinder into the box of the frame and give added reinforcement to the locking mechanism. Technology has brought vast improvements to home and commercial security. In particular, businesses are increasingly interested safeguarding their property by upgrading locks and installing security systems. Electronic locks are just one of the great new options on the market. Electronic locks are very different from traditional spring or deadbolt style locks. They rely on a series of magnets and small, electric-powered motors that are activated to open and close. Electronic locks are programmed to require the correct keypad combination, key fob, access card or biometric data, such as fingerprints, in order to unlock. Smart Electronic Locks are electronic locks with the added capability of being controlled remotely through a smartphone application. A business owner can monitor traffic, restrict access through certain doors, lock doors and activate the security system without being anywhere near the building. Usually, smart electronic locks also have a mechanical key cylinder to allow access with a traditional key. If you already have an electronic lock or you want to learn more about your particular model, check the manufacturer’s website or do a quick search online using your door handle’s part number to find the instruction manual and other information. An experienced locksmith should also be able to answer any questions you have. Time to Replace Your Traditional Locks? If you need to have your locks rekeyed or you’ve decided it’s time to increase security around your home or office, get expert advice on the best solution. Reach out to the team at Great Valley Lockshop in Malvern, PA. We work with customers in the Philadelphia area and all around Pennsylvania, Delaware, Maryland and New Jersey. 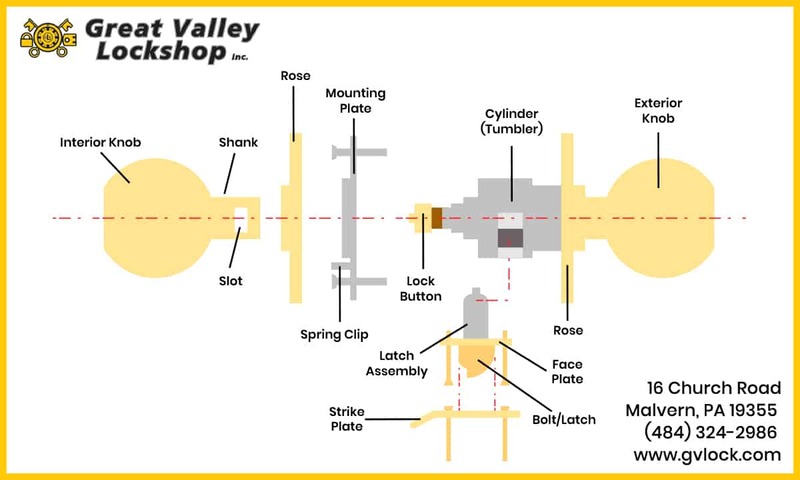 Call us at (610) 644-5334 or fill out our online request form to get in touch with Great Valley Lockshop. This blog was originally published on June 10, 2015 and has since been modified and updated to reflect the most accurate information.